A Hallmark Channel holiday movie called “Christmas at Graceland.” What a perfect idea! A heartwarming story line shot at one of the city’s most beloved spots – and with high-paying jobs and a boost to tourism thrown in! We at The Memphis & Shelby County Film Commission love clients like this! Very selective, Elvis Presley Enterprises has allowed over the years only a limited number of films to shoot extensively at the Graceland mansion – most notably, “This is Elvis,” a docu-drama released in 1981. Shot way back in the day - before Memphis & Shelby County even had a film commission - “This is Elvis” starred Knox Phillips as Sam Phillips, Jerry Phillips as Bill Black, and Larry Raspberry – wait, Larry Raspberry? – as Dewey Phillips! Legends surround this little-known film: I remember hearing from Knox that they had had unprecedented access to the mansion’s rooms for the dramatic re-creations. I, for one, can’t wait to watch it over the holidays - thanks to today’s technology and Amazon Prime Video. However, with apologies to Knox, Jerry and Larry, my money’s on “Christmas at Graceland” -- a love story shot on the grounds and in Elvis’ “front room” (as we say down South). Stars Kellie Pickler (“Pickler & Ben”) and Wes Brown (“True Blood”) portray reunited sweethearts who ponder a second chance at love which fate seemingly has thrown their way. Besides the rare Graceland locations and the appealing stars, the film also showcases some of Elvis Presley’s most memorable hits. 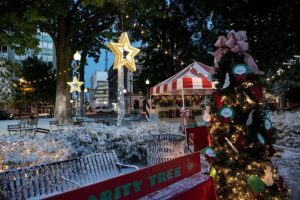 “Christmas at Graceland” promises everything one could ask for in a holiday movie: romance, family values, Memphis looking its best and -- SNOW! The largest department of the production, the special effects department, dealt only with the snow –with 12 skilled crew members – a coordinator, a foreman, “techs” and production assistants working throughout the shoot to keep a convincing blanket of artificial snow on the ground! SNOWBUSINESS of Hollywood provided the artificial snow – along with” ices” and “frosts” as needed. At Graceland, the staff unpacked the traditional Christmas decorations and lights months ahead of time -- holding a collective breath as the special effects department lay down the artificial snow on Graceland’s beautifully landscaped grounds. Special effects crew members stood by ready to refresh the snow at the slightest blemish. Besides the grounds of Graceland, other locations demanded pristine, pearly-white blankets of snow, including midtown’s Carr Avenue and downtown’s Court Square. The snow on the lawns and landscaping on Carr Avenue in Central Gardens literally drew a crowd as Memphians stared agog at what they’d never before seen – snow in Memphis in the summer! To add to the surreal feel, cast and extras played their parts, sweltering in coats and earmuffs in the 100-degree heat! However, towards the end of filming, “Christmas at Graceland” took its magical snow to the heart of downtown: Court Square. “Christmas at Graceland” will have its Memphis premiere November 15th on the Soundstage at Elvis Presley’s Memphis, the entertainment and exhibition complex across the street from the Graceland Mansion. Star Wes Brown and director Eric Close (“Nashville”) will both attend the 7pm premiere screening. The event will be preceded by the annual lighting of the Mansion at 6 pm, where country music stars Scotty McCreery and Marty Stuart flip the switch on the traditional lights and decorations lighting up Elvis Presley’s iconic home. This time-honored tradition will feature a special performance by McCreery, an appearance by Santa and 100% chance of snow! The lighting is free and open to the public. The premiere is a ticketed, invitation-only event however complimentary tickets will be made available that night at the door, based on availability. Reserved seats are also available to anyone who purchases tickets to any Graceland attraction on November 15th prior to November 2nd. For additional information visit www.graceland.com/christmas. If you miss the Graceland premiere, be sure to tune into the television premiere of “Christmas at Graceland,” exclusively on the Hallmark Channel, Saturday, November 17th, at 7pm CT. The film is part of Hallmark’s famous “Countdown to Christmas,” the network’s #1 programming event. 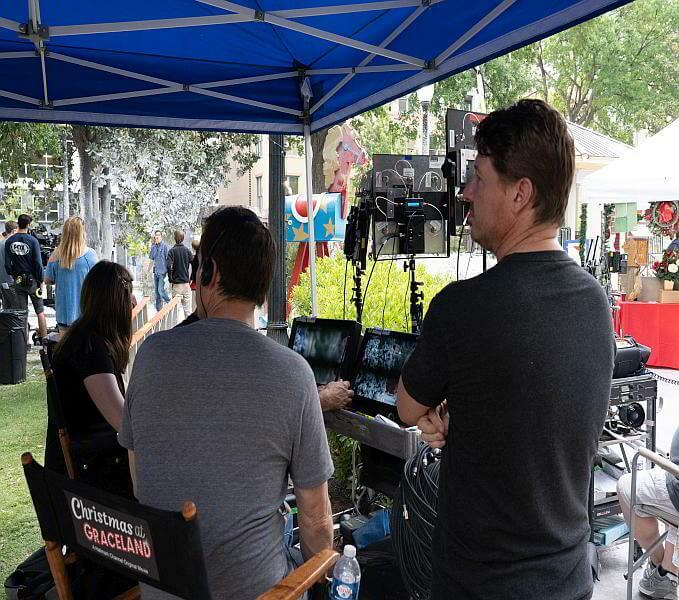 A Crown Media Family Networks Production, Hallmark’s “Christmas at Graceland” is a client of The Memphis & Shelby County Film Commission, of which Linn Sitler is the film commissioner. The film is also a client of The TN Entertainment Commission. In a previous life, Sitler has written for both local and national television, local and national magazines, and was a regular contributor to The Nashville Scene. 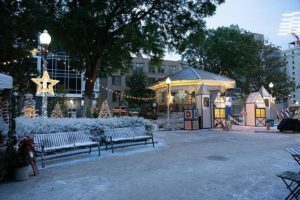 The magic of Hollywood turned the tiny square into ”… a snowcovered Santa’s Village” in the middle of the Memphis summer. Falling in love all over again! 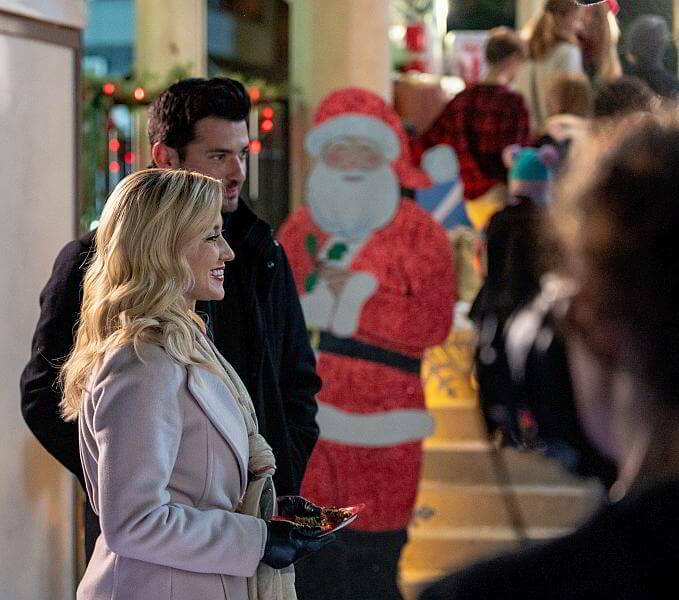 “ Laurel” ( Kellie Pickler) and “ Clay” ( Wes Brown) visit a “Memphis Christmas Festival,” set in downtown Memphis’ Court Square. Share Christmas at Graceland from 4Memphis!